Chine McDonald Crumbs on the counter. Grime in the mugs. Someone else’s dishes in the office sink for days. What an opportunity for day-to-day, ongoing generosity – dull, grey acts of kindness that don’t get you any ‘points’. Make no mistake, taking responsibility for someone else’s mundane problems is generosity that makes a difference. Green: Clean the office sink (or staffroom sink, or church sink). Amber: Take responsibility for an undone chore where you live, at church, or at the workplace. Red: Take responsibility for an undone chore for the entire month. There is a cheeky sign above one of the kitchen sinks in my office which always makes me laugh: ‘The maid is off today. So please do your own washing up.’ I agree that it’s infuriating to see dirty crockery and cutlery in the sink at work. I can’t believe that anyone would think such behaviour was acceptable – to leave items in the hopes that someone else can do your dirty work. On the days when I arrive at work already shattered from having successfully got a toddler dressed, fed and off to the childminder before commuting in, the sight of these abandoned plates and mugs makes me despair. But on my most generous days – when life feels a little less hectic – I might take the time to quietly wash these dishes rather than huff and puff and think bad thoughts about my colleagues. Doing small, good deeds like this without ceremony and without thanks is not only the kind thing to do, but it feels good too. But this is not about being ‘holier than thou’ – a saintly washer-upper. Instead, I would like to think that someone would do this for me. It reminds me that I too – literally – mess up sometimes. For all have sinned and left their washing up in the sink. I am no better than anyone else. Christ’s suggestion that we should be servant-hearted in this way is what makes the Christian faith so radical. What a wonderful thing it is to think about others more than you think about yourself, and to reflect the radical generosity of our Creator God. Chine heads up the media team at Christian Aid. Prior to that, she was at World Vision and director of communications at the Evangelical Alliance. She read theology at Cambridge University before training as a newspaper journalist. 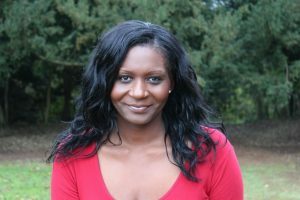 Chine is a regular speaker and writer on race, faith and gender and a regular broadcaster for BBC Religion & Ethics programmes such as Thought for the Day, the Daily Service, Pause for Thought and Prayer for the Day. Chine lives in London with her husband, Mark, and their young son.